I’ve discovered that for me it is time to completely reboot my orientation to dancing. In case you couldn’t tell, I’ve been in a bit of a downturn lately. There was a period where I was not dancing at all. Nor have I been exercising regularly. I’ve come to consider this a wash-out period, like in experiments when between treatments they will have people stop taking anything for a few weeks before trying an alternate treatment so the previous therapy doesn’t influence the results of the alternate therapy. It’s truly fascinating to watch how dancing and its place in my life has evolved. Originally it was a completely urgent obsession. I just knew I couldn’t live without it, that it was a non-negotiable in my life, and, I was driven to achieve results. Now, it doesn’t have the hold on me that it once did, but in that shift away from needing dance desperately it has paradoxically freed me up to create anew my relationship with dance. I realized, if I was honest, that I had been sucked in by the glamour of the dancing world. Also, praise and attention garnered from dancing were potent, almost addictive “juice” to my ego, which so badly needed validation. Only problem is that depending on external approval and praise leads to seeking it. I became so concerned with not making a fool of myself, being worried about looking good, and feeling pressure to be exceptional with the level of my dancing so that I wouldn’t be considered a laughingstock, that I was unable to genuinely enjoy what I was doing. I failed to be truly present and I failed to savor dancing for the sake of dancing, exactly how it is and exactly how it isn’t. I’m now present to a new openness, a new space to express myself more authentically. 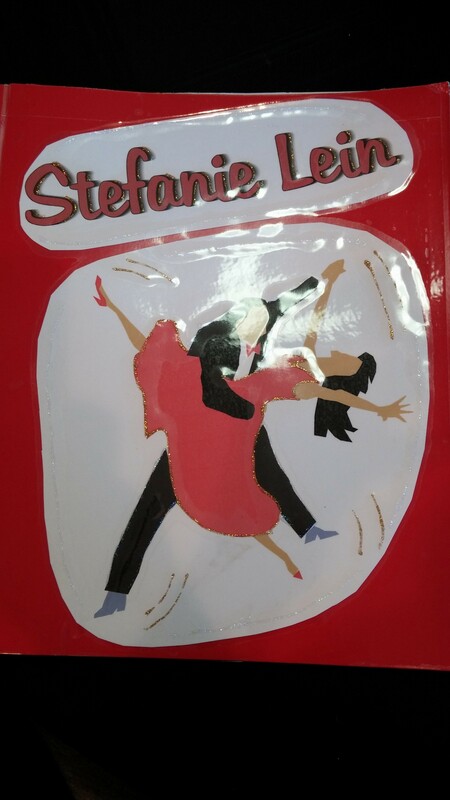 With Kristijan, we’ve been working on “just dancing” and my, what a relief it is! Ivan and I also agreed to “just dance” for now. No competitions are on the horizon. I want to discover ease, fun and play in my dancing, which is probably the exact opposite way of being that I had used before to try and power my way through. Now it’s about surrender and release. Now it is about connecting and being so present with my dance partner in the moment that my mind is silent, that there is nothing else in the world to attend to but what I am doing right then, and it is peaceful. The mind is quieted and all there is is experiencing the very step I’m taking, the muscle that is contracting, the points of pressure below my feet into the floor, the signal from his hip to mine that it is time to move. I’ve never felt more secure and free in my dancing, ever. It’s now become about me expressing myself, nothing more and nothing less. And I find not only is it easier to move, but also that there is a richness and a fullness that had been lacking when I was so consumed with getting everything “right!” I’m choosing to now give myself some grace about how human I am, and this will serve me well as I rebuild myself into a dancer who desires to share her art in performance once again. I have a way to go! My cardio capacity is nowhere near where it was nor where I’d want it to be to perform publically. I’ve put on weight, which doesn’t help the situation. My diet has been erratic as have my sleeping patterns. This is what’s so. And, I’m committed to getting myself to where I desire to be with joy, fun, play and ease this time around. I’ve tried and I’ve tried, I’ve pushed and I’ve worked hard, and I’ve even created some results while practically forcing myself. This time I wish to abandon the struggle. I’m even willing to surrender the idea that I will ever dance again in a competition. I’m willing to surrender the desire to change my body at all. I’m willing to be in 100% acceptance and peace with what is so, right now. Now that’s a new way of doing things in this area of my life! So for now, I’m just dancing. And I trust the process. Even as I surrender the need for anything to change externally, I am committed yet unattached. I have an inkling that applying the same space that is serving me so well around my dancing will serve me in my other goals in life, especially concerning my health. I choose peace, joy, and acceptance. I reject struggle, angst, and willpower. At the end of the day I believe it comes down to trusting in a higher power than my small self that can see the bigger picture that I am blind to as I focus myopically on self-centered problems. Really there is no problem at all, except perhaps my perception that anything is a real problem. I feel lighter, even as my body appears larger and more fluffy. Even as my cardio is clearly out of whack, with the lack of internal resistance to it and without the need to label it as hard, difficult, or unfair, it is miraculously easier. It reminds me of the use of oppositions in dancing. When moving forward, I think of my back leg and stay in it as long as possible until I’m over the forward moving leg. I delay as long as possible in a delayed forward step to generate speed in my alemana. Like a bowstring pulled backward to generate the arc of an arrow, I find that in my dancing, for it to be stable, comfortable, rich, and full, I often must mentally project my energy in the opposite direction of which I am physically moving. If I think about moving forward and project my energy there while I’m physically moving forward, I am off-balance, it’s chaotic, it’s uncomfortable. I think that’s what I have been doing with my goals around my body…constantly striving and pushing and forcing. Now it is time for balance – it is time to take practical, consistent action in alignment with my goals while doing them in a spirit of joy, enthusiasm, peace, and love. There is no magical thinking here to sit back and let God handle it…but there is a new willingness to take the actions I know to take, letting God guide the process, realizing I don’t have to do this alone, and actually I have been completely unsuccessful doing this alone. It is insane to continue to perpetuate old ways of being. Time to try something new.